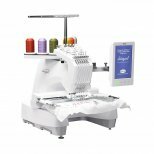 Atlanta Sewing Center is one of Metro Atlanta’s top Baby Lock Sewing Machine and Baby Lock Embroidery Machine dealers. ASC, Atlanta Sewing Center, wants to help you make your next home sewing project simple and fun with a Baby Lock Sewing Machine. No matter the question, our experienced team of sewing enthusiasts is on-hand ready to help! For over 40 years, Baby Lock Sewing Machines and Atlanta Sewing Center has been dedicated to the love of sewing by creating machines for sewing, embroidery, quilting and serging – all with ease-of-use, high quality and a touch of elegance. In addition to easy-to-thread sergers and sewing machines for sewing enthusiasts of any level, Baby Lock enhances the love of sewing with an extensive line of sewing supplies including accessories, software and stabilizers.